Mental Illness is such a real illness that isn't completely understood, and in some cases, it is very deadly. Mental illness is not being taken as seriously as it should be, and that's why we have mental health advocates around the world trying to raise awareness and provide education and proper resources. That being said, in order to help others, we need to be able to open up and share our stories and hardships with others. Showing others that they are not alone, is the first step. 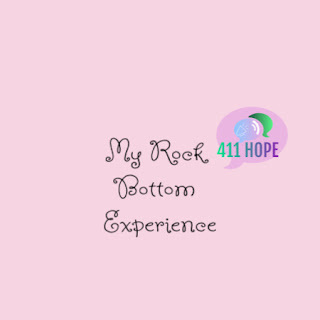 So, I have decided to open up, and share my rock bottom experience with everyone. Back in 2016, life was a giant ball of mess, and I know plenty of people felt the same that year. It just seemed that absolutely everything in my life was going downhill from the start. It started when I had a huge falling out with a friend who used to mean the world to me, it truly felt like mourning, mourning the loss of someone who is still alive, but chose to be absent from your life. I went through months of struggling with it, I did not think I was going to ever get past it, I believed I was not going to survive without this friend. June 2016, I graduated from community college. I was so happy and felt so accomplished. The day after, I had moved to a different city to live with my sister and her family for a little bit while i looked for a job, just to try out a new beginning, because sometimes that is all we need. I ended up getting a job, and at first it was great, and I was starting to feel happier. Eventually though it wore off and things got bad again. The only people I knew were my sister and nieces, I didn't actually really have friends, an the people I worked with were not the most friendly people, and definitely would never want to hang out outside of work with me. So of course, not having any friends brought out many feelings of loneliness, especially seeing friends back home being able to go out and do things and I was not able to join them. By the time September/October rolled around, I was prescribed anti depressants. At first, nothing changed, so the medication got changed. In November, I started struggling so bad, and I could not describe my pain to anyone. I was numb, I was having bad breakdowns in my room, I was having crying spells and irrational anger. I was in bed for 5 days, would not leave it unless I absolutely had to. I did not even want to shower. I was bad and I was in a crisis without knowing it. I started to binge drink alcohol a lot more than I normally did, and would blackout in my bedroom. There were moments where it truly hurt to breathe, and I just laid there not feeling anything, I was numb and that was by far the worst feeling ever. this lasted for weeks. November 28th 2016 was the day I hit my rock bottom. I woke up in a numbing pain, unable to breathe and needed to cry but I just couldn't. I laid there and was feeling so tired of the numbness, i wanted to feel something again, and I reached over and overdosed on my medication. After realizing what I had just done, I started freaking right out. I was scared to die, and ended up calling a friend. I ended up having quite a few episodes of vomit, and ended up telling my sister what happened later that morning. From there we went to the hospital and I was taken to the trauma room and hooked up to IV and heart monitor machines. The rest of the day was being checked up on, and speaking to different doctors and psychologists. All in all, It was a very scary day for me and the people around me. I am so glad to still be here, there have been many changes in life, good and even bad sometimes. Life is not easy, but it sure as hell is worth fighting for. I am so thankful to have survived, not everyone gets a second chance. If you are reading this, and made it this far. Thank you. If you ever think of giving up, just know that things get better eventually. Things change. No matter where you are in your storm, in your journey of life, you still have a future to look forward to. Just get through this rough patch step by step. I promise that in the end, it is worth it.